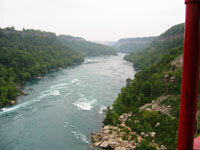 The Niagara River is about 56 km (35 miles) long, flowing from Lake Erie to Lake Ontario. It is one on the world's greatest sources of hydro electric power. The river drops about 99 meters (326 ft) between the two lakes. The Falls are at the half way point. The area drained by the Niagara River is approx. 684,000 square km (264,000 sq miles). The average fall from Lake Erie to the Upper Niagara Rapids is only 2.7 meters (9 ft). The Combined volume of Flow from . . .
-the remainder of the water is removed upstream and shared jointly for hydro generation by Canada and the US. Are the Falls Eroding Away? The Horseshoe Falls has a hard top layer of dolomite limestone with softer layers of sandstone and shale below. 12,000 years ago Niagara Falls was 11 km (7 miles) downstream from its present position. Until the 1950's, the brink of the Falls was eroding at a rate of 1 meter (3 ft) a year. Since then, the water diversions have spread out the flow more evenly, slowing the rate of erosion. Now the rate of erosion may be as low as 30 cm (1 ft) every TEN years. Sir Adam Beck Generating Station #2, the Robert Moses Niagara Power Plant and the International Control Works use the diverted water before it returns to the Niagara River and drains into Lake Ontario. In 1641, the word ONGUIAAHRA appears on maps. Both it and it's later version ONGIARA, are Indian words that mean 'the Straight'. By the white man's arrival, the name in general usage was 'Niagara'. The Falls The Canadian Horseshoe Falls is 52 meters (170 ft) high with the water plunging into the Maid of the Mist Pool. The American Falls ranges from 21 - 34 meters (70 - 110 ft) down to the rocks at the base fo the Falls. The Gorge extends 11 km (7 miles) downstream from the Falls to the foot fo the Niagara Escarpment. 168,000 cubic meters (6 million cubic ft) of water flows over the Falls every minute during peak daytime hours. The depth of the water at crestline varies due to various flows and river conditions.